The sad story is finally told - some crayons can color more things than other crayons; and some crayons sit in the crayon box even as their friends live colorful lives. A playful preschool concept board book about colors that uses the illustrations from previous books. This will be a fun way to introduce the series to younger readers. Without the mirth of Daywalt's other "Crayon" books. Not recommended to fans of the series. Just rehashing the content from the original story and turn a profit. Not worth a read. This was such a cute little book. The pictures and facial expressions are just adorable and the colors are very vivid.I would like to use this children's fiction book in a kindergarten classroom to help learn colors and coordinate those colors to items. I would also like to use it to show the class how they are each unique individuals but when we come together as a whole we can create some wonderful things together. A cute addition in the "Crayon" library. An easy and fun read that incorporates using colors. A great way to introduce 2-4 year olds to the "Crayons". Some of the story is borrowed from the crayon series but, it is still a joy to read. Of course, the "Crayons" would definitely do a book about colors. It was so totally obvious. Great book for color recognition. My 2 year old had a great time associating colors with objects she knew and the story was cute too. The end of the book was the best allowing her to find each of the colors on her own. Orange crayon is being cheated, but I can't get enough of these illustrations of humorous asides by the crayons. I love the subtle push towards nonconformity! This is great for preschool and Kindergarten! Cute book that I will have to buy for my niece. I read it when i was small. ITS SO CUTE!!! https://www.goodreads.com/review/edit... doesn’t love books by the amazing Oliver Jeffers? And who didn’t love ‘The Day the Crayons Quit’? Well if you’re a fan (and I have no doubt in my mind that you are) then this book is sure to be a hit in your household.‘The Crayons’ Book of Colours’ is exactly as the title suggests. Unlike the narrative of the original this book gives each of the crayons its chance to shine and demonstrate the amazing variety of images that can be created. Illustrated in the child-like style associated with the series, the crayons draw all manner of things to demonstrate their variety, including elephants, clouds, rainbows, baby penguins and grapes...Read my full review here:https://redwaybooks.wordpress.com/201...Perfect for very young children as an introduction to the series. I have loved Daywalt's other crayon series. This book fell short. First I didn't realize it was a board book sine his others weren't. Second, probably because of the first, the story was non-existent. Third, why do beige and peach get snubbed in this book? They are vital colors. This is another super cute book with crayons. I love to color and draw, so this is perfect for me. It's another one that would be perfect for National Crayon Day to read to the younger kiddos. It could also be a fun way for the youngest kiddos to learn their colors and the names that go with them. My kiddo loves this one. It is very cute even if he does not get some of the sly humor (like the black crayon colors rainbows and beach balls, and the pink crayon wants to color not only princesses, but a dinosaur and a cowboy). I LOVE THE CRAYON BOOKS! I think they are so cute and funny! They never fail to get me laughing. This book wasn't any different. When the beige crayon says they can only color wheat, you laugh because it's so true. They have spoken upon something that was always there just never expressed with such humor. The crayons are taking a stand! You better buy this book and listen! Used with older kid storytime to talk about similarities and differences in multiple versions of books. The kids really enjoyed discussing the "baby version." A delightful book full of a multitude of coloring options by very creative crayons. I am more than a little annoyed. The words are different but 90% of the illustrations are exactly the same as the crayons book of numbers. It's lazy and cheap. Not sure what was going on with the black crayon but this was cute. This board book is a nice introduction to some of the thing different colors represent. Add silliness and you've got a great book. The crayons from "The Day the Crayons Quit" are back. Each crayon introduces things that crayon has colored in, such as Red crayon coloring strawberries and hearts.This could easily be used as a felt or prop story in story time. The crayons in the coloring book are each bright and full of things they like to color. But what can they achieve when they blend their colors together for a special surprise? Great color teaching book with a touch of humor. Drew Daywalt Oliver Jeffers - Ever since his childhood in one of Ohio’s most haunted houses, writer director Drew Daywalt has been writing escapist fantasy and building worlds of his own. With a degree in Creative Writing, and a concentration in Children’s Literature from Emerson College in Boston, Daywalt set off to Hollywood where he spent years writing for Disney and Universal on such beloved shows as Timon & Pumba, Buzz Lightyear, and Woody Woodpecker, and where his animated series The Wacky World of Tex Avery garnered an Emmy nomination. His first trip into live action landed him studio screenwriting and feature film directing work with such Hollywood luminaries as Quentin Tarrantino, Lawrence Bender, Tony Scott, Brett Ratner and Jerry Bruckheimer. 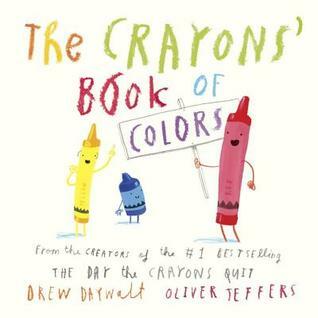 With an eye toward picture book writing, Daywalt’s first book THE DAY THE CRAYONS QUIT, illustrated by Oliver Jeffers, debuted on the New York Times Best Seller’s List in June 2013, and has since become a Number One Best Seller.